The royal burgh, cathedral town, largest settlement, and proud capital of Orkney is Kirkwall. But this was not always the case. For a long time, Orkney was administered from elsewhere. 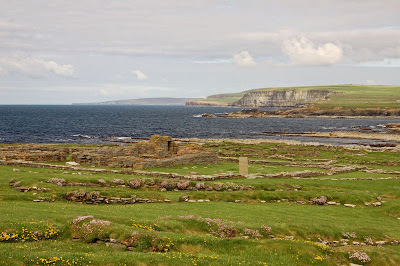 At the dawn of recorded history about 2,000 years ago, the King of Orkney lived at the Broch of Gurness, an iron-age complex on broch-lined Eynhallow Sound. But the Vikings had other ideas. As pirates their base had to be an eyrie, somewhere with a good view up and down the whole coast. The Brough of Birsay fits the bill perfectly - in one direction, you can see all the way to the Old Man of Hoy and, in very clear weather, Scotland. In the other direction, all the way to Noup Head on Westray. Nobody can sail along the west coast of Orkney without being seen from Birsay. The Brough of Birsay is a tidal island, which can be reached via a slippery shore-side scramble from the mainland at low tide. When the Vikings arrived, there was a Pictish village on the landward side of the Brough. They were soon displaced and the Norse took over. The village is in a sheltered spot on the landward side of the Brough of Birsay, looking over the causeway. Now oystercatchers nest in ruins that once housed farmers and pirates. From the village, you can walk the circuit of the island. Birsay rises continuously north and south from a low sheltered eastern shore to a spectacular western cliff edge. The lighthouse perched here can be seen for miles. Fulmar, puffins, razorbills and other seabirds nest in the cliffs, the split slabs of Orcadian sandstone providing perfect ledges to lay eggs. Today, like so many significant sites in Scottish history, the Brough is ruinous and deserted. Just you, the birds, and perhaps another tourist or two wandering about soaking up the atmosphere. Not many people visit there. Like the sea cliffs.